University of Pennsylvania Assistant Professor of Neurology, Michael Rubenstein began providing semi-annual neurology care at the Foundation for African Medicine and Education (FAME) in Tanzania in 2010. Since then, he has brought University of Pennsylvania neurology residents and fellows to Tanzania to provide increased availability of outstanding outpatient neurology care to patients both at FAME and in numerous villages. 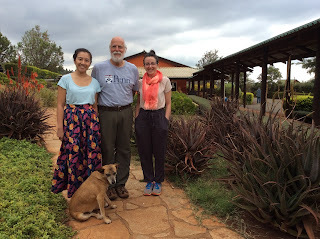 PGY-4 resident Anh-Thu Vu (Left) and PGY-3 resident Ali Mendelson (right) flank Dr. Rubenstein on his most recent trip to Tanzania in October.